We are a group of all ages and varying abilities. We enjoy our pastime and are enthusiastic about keeping the heritage of church bell ringing alive. Not all the members ring regularly and not all are churchgoers but we try to ensure that the bells are rung for three quarters of an hour before all 9.30am. and 11am. morning services. We also ring for weddings, the Remembrance Day service and on other significant occasions. In September 2003 we joined forces with our sister church, Bratton, so that we could enable our more proficient members to progress more rapidly, as well as continue to encourage new and existing members to learn at their own pace. In 2008 Erlestoke Church bells were repaired and we are able to ring on all three sets of bells which allows us to experience the ‘feel’ of different towers..
Mark Noble, our combined towers captain, leads us in our Wednesday night practice (7.45 – 9.00 pm.). We use each tower on alternative weeks (see notice in the church porch for dates in the rota). The ringing at practices and for services is tailored to the proficiency of the ringers attending. We would be delighted to invite you to join us if you are already a ringer. If you have never rung and would like to ‘have a go’, or learn in earnest, then we would be pleased to welcome you. It does not require much strength so teenagers and older all qualify as potential candidates. For some of us, the most tiring bit is climbing the stairs of the bell tower! 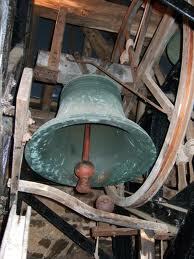 There are ten bells in Edington Priory Church; five of which came from St Giles at Imber on Salisbury Plain. The treble weighs 4cwt. 3qr. 24lbs. and the tenor 24cwt. Oqr. 24lbs. All have inscriptions on them. The Benefice has another ringable tower with six bells (the tenor of which weighs 25 cwt.) at its Bratton Church. Erlestoke Church has six bells but these have deteriorated and are not ringable at present.